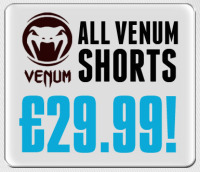 All of our Venum MMA Fight Shorts are currently on Sale for A?24.99 while stocks last. This is one of our most popular ever sales and the shorts are flying out already, so be quick in grabbing a pair that you like while we have it in stock! Take me to the Venum Fight Short Sale! This entry was posted in News and tagged Venum, Venum MMA Fight Shorts on 11.10.2012 by .